Following on from Part 1, here’s some more of my best gaming memories. Back in 1996 I shared a place with some friends. We’d strung BNC ethernet over the house and already to get our deathmatch on with Doom and Duke Nukem. 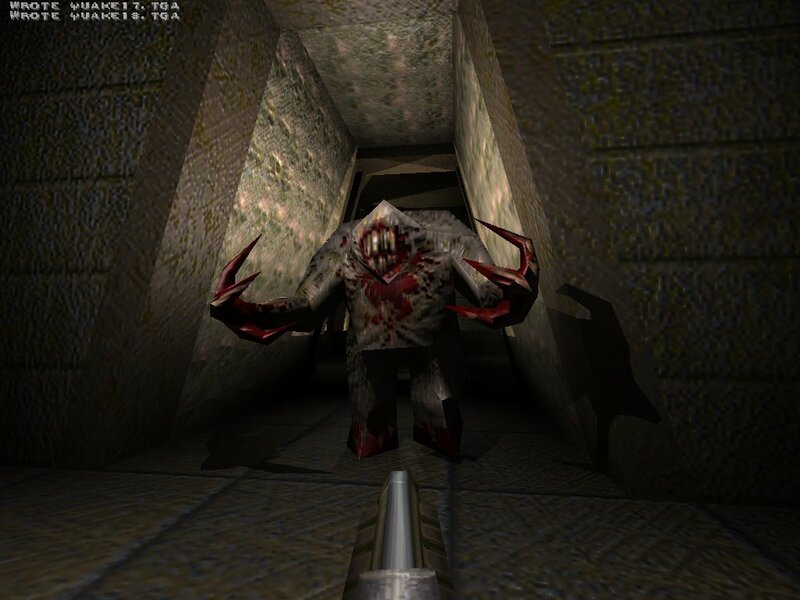 The shareware release of Quake changed everything though. It came with a handful of standard weapons and maps but it was the true 3D and physics that really blew my mind (all the other FPS games were ‘pseudo’ 3D). And the grenade launcher; bouncing the little metal oblongs of death everywhere never got old. I just watched how the grenades would bounce differently on different angled surfaces or how they’d bounce back down stairwells to you while you (briefly) looked on in horror. I’ve had a bit of a ‘hate-hate’ relationship with grenade launchers since (spammity spam spam McSpam) but as a show-case for a new way of gaming they were awesome. I already posted a large gallery of shots I took from my trip to the galaxy centre. 20 hours of real-time well spent; the sights were amazing and because of the number of systems and the procedural generation you could well be the only person ever to see them. I played World of Warcraft from release. There were lots of cool moments over the many years I played (I stopped after WOTLK and came back briefly for MOP) but raid leading was maybe the most memorable. I often found raiding a bit dull. The ‘scripts’ to beat the bosses were well understood and everyone had their prescribed roll. “Don’t stand in the fire” pretty much covered everything. Your gear upgrading made a far bigger difference than playing your character any better (past a certain level of competence at Not Standing In The Fire). But with raid leading that all changed. I was part of Lunar Templars a small guild with players ranging from casual to hard-core. Getting the right number of people for a raid was hard and we never had the right composition. All the Internet guides with their “just use the Paladin off-tank here” or “feral druid trivialises this boss” were totally useless. If they’d optimised their guides for “Priest who is a giggly drunk” or “Tank who can’t turn left” then we’d have been away. So; inspired improvisation was the order of the day. Trying to fit 10 or 25 square pegs into round holes while coming out without the Guild leader killing any one was a whole new game. All those guilds killing Heroic bosses? Pah! Try killing Arthas with a main healer who has magnetic attraction to fire, DPS who kill their tank more than the boss and tanks refusing to use anything other than PvP spec because they don’t want to spend any gold. Ultima 7 was a ground-breaking game game; it had loads of elements that many RPG’s today don’t have. A full paper-doll inventory where your equipment is shown in game; NPC schedules so the people you see in the world always seem to be going about their business and a real sense of a cohesive world at large. But it was the murder that really got me interested. The start of the game had been very cool; the main antagonist seeming to come out of your monitor and taunt you (as the Avatar) before you get up from your computer and go to Britannia to see what’s going on (through a MoonGate in your back garden obviously). When you get there you find out it’s been decades since the last time you were there and the world has…. changed. There’s a bit of exposition but you don’t get a real sense of how wrong things are until you explore and find the murder. I remember it really took me back; a ritual killing with creepy music and a gore everywhere. It was weird to see evil on screen; in the RPG’s I’d played the foe’s plan was abstracted, “gather 8 jobbies to take to the thingummy before the Big Bad eats The Celestial Hamster”. Here the effects of his influence were laid out in front of you. And a mystery! The victims were just normal people; not The GateKeepers of Axposition. There was not real obvious reason for it and the plot behind it takes ages to unravel. But by then Ultima had it’s hooks firmly in me!